Shoudoshima 小豆島 is a small island South-East of Okayama, just East of Shikoku. Despite being largely empty and dotted with several burnt out or abandoned hotels and buildings, it has some great sights off the beaten track. It's a famous location for soy sauce production. In fact, the whole island literally stinks of it 24/7. It's very cycle friendly (the island bus is pretty infrequent anyway), and it's definitely worth renting bikes to see the sights. The Hostelling International place rents out granny-bikes for 300 yen a day. Cars can be rented from several places, but book ahead in high season. Pick up a map at the port you come in to (usually Tonoshou), but don't expect much English help there. 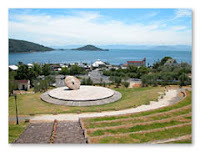 Shoudoshima was the site of the first successful olive plantation in Japan. The predictable result of which is an obsession with olives and olive trees. You can visit the (huge) olive grove along the main (only?) road which runs along the south of the island. Amongst the many trees and beautiful paths is a park and windmill, showing off the heavy European presence, with a picturesque sea view. There's also a spa, and botanical garden. You can't miss it, and the bus stops at two points from which you can enter. The film Twenty-Four Eyes was filmed here, and the film set still stands at the Eastern end of the island. It's an interesting site with exhibitions, shops, a pond filled with extraordinary varieties of salt-water fish, and restaurants. If you visit in the summer, beware of the baking heat and find shelter in the old houses perfectly preserved from the very start of last century, including the schoolhouse now containing ancient camera equipment used in making the film. Another point of interest is the soy sauce museum, again along the main road running West to East along the Southern coast. My girlfriend hated it, but I thought it was very interesting. It explains the old-time method of soy sauce production, allows a glimpse at modern production in progress, and even gives a free bottle with the 220yen entrance fee. Outside you can try the surprisingly tasty soy sauce ice cream. There are several other things to do, including scaling a local mountain by ropeway and seeing a bunch of temples, so check out the Shodoshim town website (English) for more. The island is split into two halves. The lower, and larger half is Shoudoshima city, and the upper section is Tonosho town. Between lies... well, nothing really. The total circumference is 126km. There are a couple of high-end hotels, and one or two drastically lower-end hostels on the Shoudoshima city side of the island. Don't expect many good restaurants. Or many at all, in fact. We survived on solely convenience store food when we visited, simply because we couldn't really find anywhere to eat without a long commute. However, there must surely be a few izakaya, yakitori etc places hiding in the local neighbourhoods off the main road. Shoudoshima Island is a great place to go on vacation. I would love to get there this summer to see it with my own eyes. I've never been in japan but i saw some awesome pictures and videos! It always makes me happy when people go discover the islands of Kagawa. -The Kankakei gorge, one of the most beautiful gorge in Japan. -The 88 temple pilgrimage, a smaller version of the Shikoku Pilgrimage. We could also, mention the small valley east of Tonoshō, where the small villages of Hitoyama and Nakayama lay. A wonderful little valley full of rice paddies, which also was one the sites for the Setouchi International Art Festival last year (there isn't much left of it on Shōdoshima, sadly) and the "lovers rock" (I'm not sure of the real name) in Tonoshō. Japanese Ability to be Linked to Visa Extensions?